Being one of the leading manufacturer and exporter of the industrial workbench, we offer variety of workbenches for the different applications. 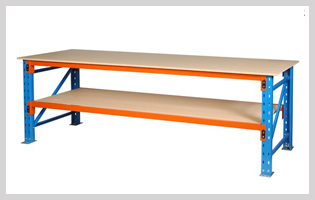 We provide workbenches for packaging, material handling and also for transporting various products. Our workbenches are available with variety of combinations with workbench tops. Perfect combination of brilliantly utilized space and sturdy construction leads minimum maintenance, maximum consumption of space. We focus on space saving method for manufacturing of the workbench. We also offer workbench equipped with an attachment to grab the bins or bottles. Industrial Workbench provide efficient construction base as an add-on table, which is available in two fitting option. It is fitted on one side or both the sides. It is available in various size and configurations to suite ideally with the assembly lines. Workbench contains roller tracks for sliding the bins. We also offer workbench equipped with an attachment to grab the bins or bottles. We provide this workbench for the small working appliances. It helps in automation of various procedures. Support elbows, forearms and wrist of the operator.